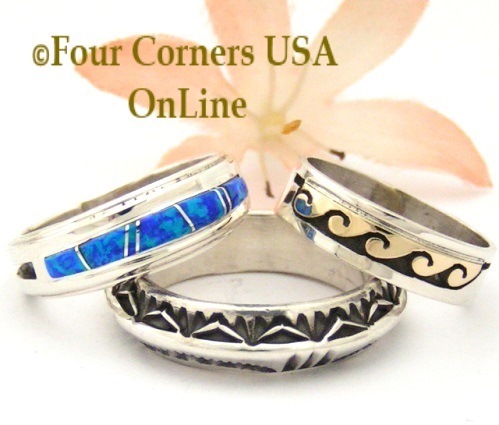 Native American Navajo Artisan Wedding Band Rings are a wonderful alternative to traditional style Wedding Rings for both Men and Women. Whether choosing an All Metal style Wedding Band including hand forged Sterling Silver and Mixed Metal Silver with Gold Overlay or brilliant Stone Inlay Ring including Turquoise, Coral, Spiny Oyster, Gaspeite or Fire Opal for those who prefer a bit of color. Featured Jewelry Artisans include Navajo Silversmiths Ella Cowboy, Wilbert Muskett Jr, Skeets Family and Darrell Cadman. We offer a large selection of Inlay Band Rings in various colors and sizes In Stock for immediate delivery.